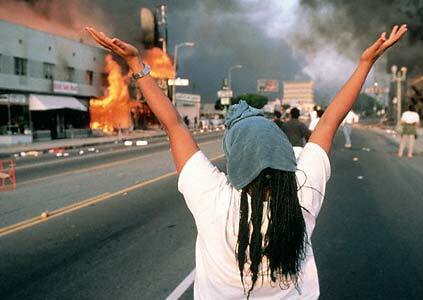 Scene from the Los Angeles Rebellion of 1992. Los Angeles—April 29, 2018, marked the 26th year since the Los Angeles Rebellion. The Rebellion was a reaction to a real accumulation of racist actions and policies in Los Angeles and the country, directed against Black people day after day and generation after generation. In South Central LA a few dozen people gathered at the Faith United Methodist Church. Jamaal Williams, principal of nearby Locke High School, gave a short keynote address. His school had an excessive amount of guards to stop many fights, especially between Black and Latino students. Yet Mr. Williams greatly reduced the number of guards when he became principal around 10 years ago. He changed the school’s approach from discipline and force to one of mutual respect and positive intervention. 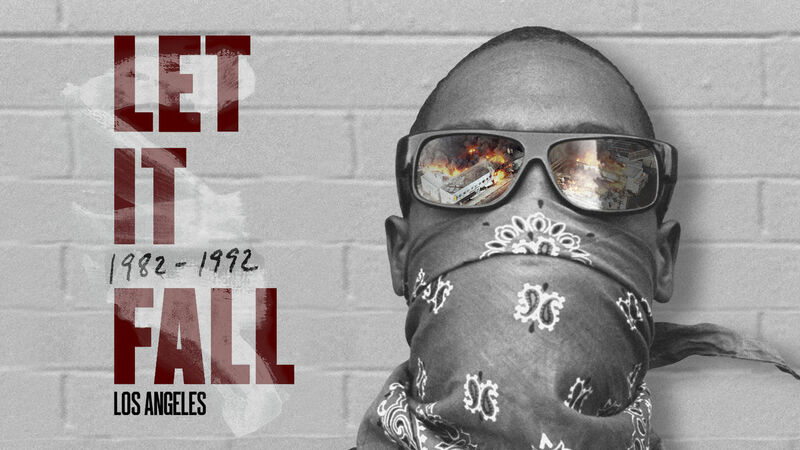 The main event was a screening of the documentary, Let It Fall: Los Angeles 1982-1992. This film covers the five days of violence and goes back a decade to portray the objective situation for Black people. It documents how the city invested money in trendy white neighborhoods while letting Black neighborhoods languish; how a gang shooting of Asian university student Karen Toshima merited extra police patrols three years before a store owner, who fatally shot Black teenager Latasha Harlins in the back of the head, got sentenced to probation. Meanwhile, LAPD “compliance” policy moved from Tasers to chokeholds, to clubs/batons. Merciless police beatings like what happened to Rodney King became ubiquitous—more than 700 occurred in 1990 alone. In depicting the Rebellion, the film did not just show the helicopter film footage of white and Asian drivers pulled from their vehicles and beaten at Florence and Normandie. This is the footage TV networks replayed over and over. Less highlighted in the press, but included in the film, were the responses of Black people living nearby. Some were walking on the street or saw violence on TV and decided to stop their neighbors from beating up the people passing through. They intervened with their bodies and drove the injured to a hospital. Featured in the film, News & Letters member Georgiana Williams (no relation to Jamaal Williams) spoke about being at a beauty shop as events began to unfold, and trying for more than an hour to get back home in blocked traffic. By that time the beatings had already happened. Williams was also an organizer of the film screening. Confirming her worst fears, her son Damian had been one of three people pulled into the passion of the rebellion that night who were rounded up and publicly indicted in a political heat storm. When it became clear that the charged environment of white fear and racism would try to shackle these youth with long jail sentences that Rodney King’s beaters never got, community members began to hold meetings. They organized a legal team and public action campaign to defend these men, who with others became known as the LA 4+. They were determined to accentuate and build upon the philosophical ground of what had to become a rebellion: Black life is not something stolen on the cheap. It is meant to be a life where Black people are able to preserve and enjoy the fruit of their own meaningful work. Two decades later, the objective situation has not changed much, but neither has its propensity to birth new rebellion and ideas for change. For example, “Big Money Griff” spoke about his successful legal fight to take long-handled flashlights out of the hands of LAPD officers after seeing how they were used as batons. Systemic transformation is not a vague idea for BLM, which has convened committees of Black youth, workers, women, and men in chapters throughout the whole country. Together they’ve hammered out pathways toward transformation of the white-dominated U.S. political system. The documents, called the “Vision for Black Lives” and “Campaign Zero,” are both available online. A politics that veers from the justice of their prescriptions cannot last without the expectation of rebellion. This entry was posted in Alerts & Appeals, Articles and tagged Black Lives Matter, Buddy Bell, Eric Rivera, Georgiana Williams, Jamaal Williams, Karen Toshima, LA 4+, Latasha Harlins, Let it Fall Los Angeles 1982-1992, Locke High School, Los Angeles Rebellion of 1992, News & Letters, Rodney King, South Central Los Angeles. Bookmark the permalink.